Spice Temple has been on my wish list for places to eat for a while now. The menu pays homage to and draws inspiration from the provinces of Sichuan, Yunnan, Hunan, Jiangxi, Guangxi and Xingjiang. I particularly like dishes such as Gong Pao chicken and pickled cucumber. Today’s recipe is a dish I was inspired to make after dining at Spice Temple Sydney. It has been forever ago since I last had steamed fish. I don’t think I ever like steamed fish as much as I like it now. Maybe my palate had changed over the years? 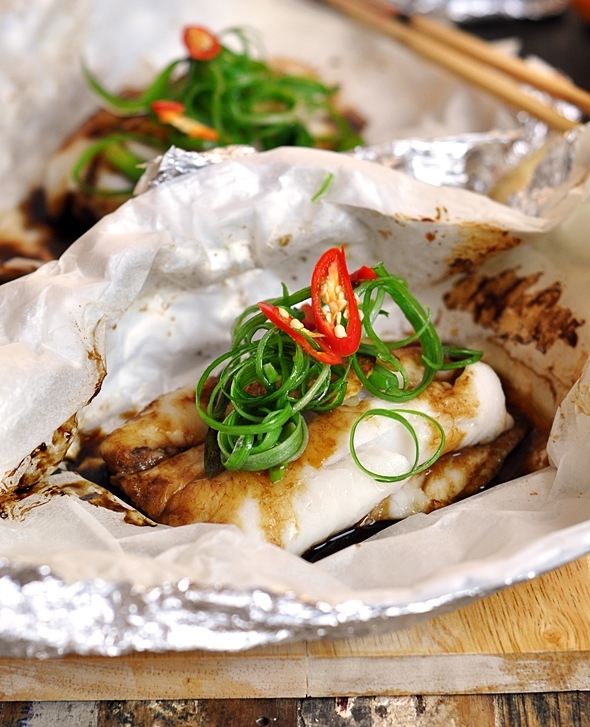 Chinese has strong emphasis on savouring the freshness of seafood. Hence, you’ll usually find the seafood dishes are subtly flavoured with humble ingredients such as ginger, garlic and spring onion. 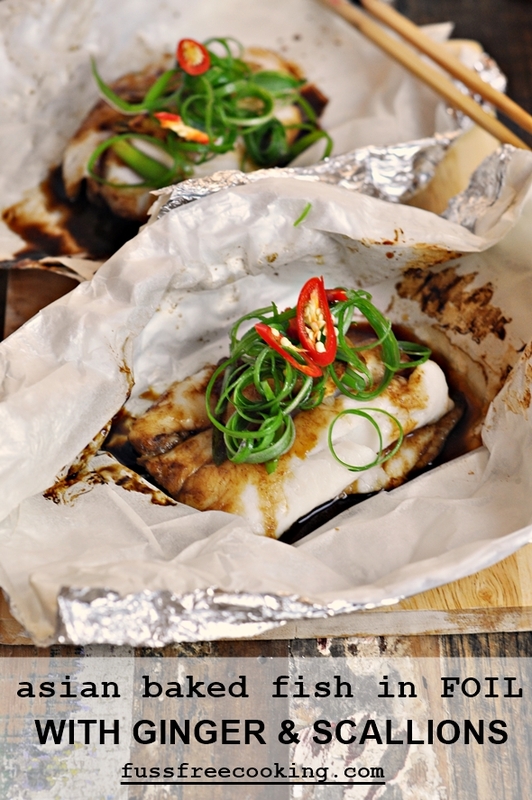 Instead of steaming, I like the idea cooking the fish in an enclose baking paper and alumium foil parcels in the oven. 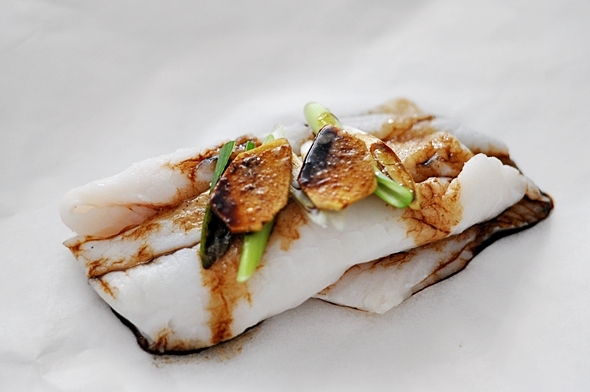 The texture of the fish from cooking this way is somewhat similar to steaming: moist and incredibly tender. The beauty of this method is that you can come home, preheat the oven, lay out baking paper and aluminium foil and put all the ingredients on the baking paper, wrap it up and bake for 10 minutes. From start to finish, I’d say it would only take me under 30 minutes! Who doesn’t love a speedy and healthy meal like this? Preheat oven to180C/350F. 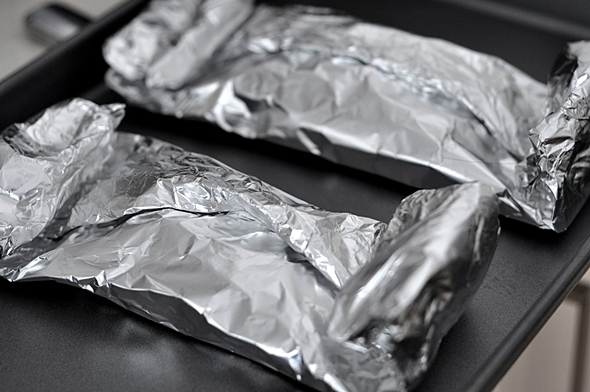 Prepare 4 sheets of baking paper and 4 sheets aluminium foil, both cut into 35cm lengthwise. 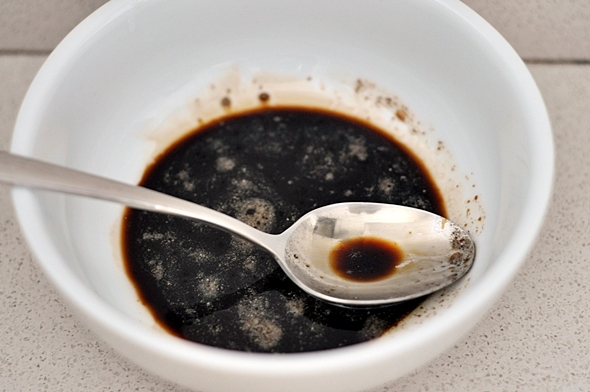 In a small bowl, mix together soy sauce, water, vinegar, sugar, pepper and sesame oil. Using a fork, whisk until well combined and set aside. Cut the spring onion in half. Thinly slice the white part of the spring onions diagonally which will be cooked with the fish. Slice the green part of the spring onion resembling thin threads. Soak them in cold water to enable them to curl up. 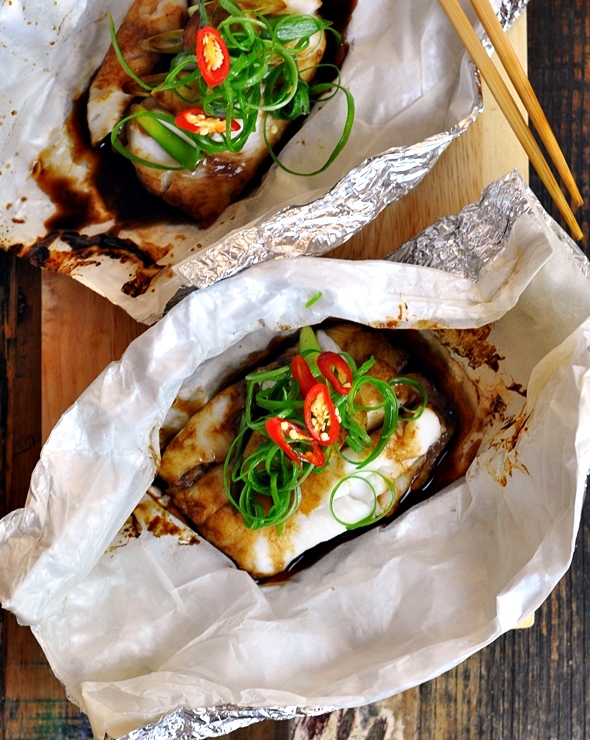 To assemble the fish parcels, first lay down the aluminum foil and followed by baking paper. 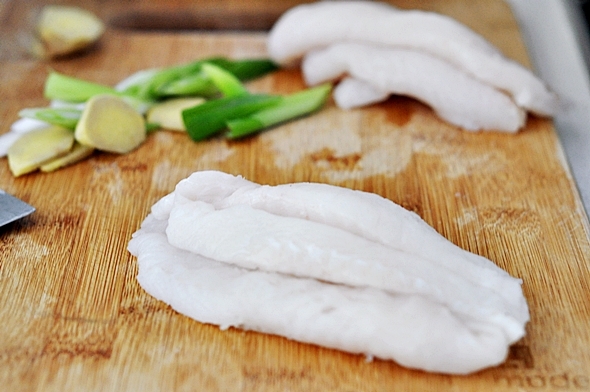 Roughly divide the ginger slices in 4 portions (one portion per fish). Then halve each portion of the ginger slices. One half portion of the ginger slices to be place on the baking paper, followed by one piece of white fish, spring onion and the remaining half portion of the ginger slices. Drizzle with the sauce concoction made earlier (slightly under one Tablespoon per parcel). Fold up to enclose the filling. Repeat with this step with the remaining fish. Bake the fish in the preheated oven for 10 minutes or until just cooked through. Open the parcels and garnish with spring onion curls. Serve immediately with rice and sauteed vegetables. Hello, I wonder what type of fish you used, or would recommend? P.S: I have just moved to your old home town of Orange!!!!! Thank you Emily. I’m going to pop over to Harris today and pick something suitable. Orange is a unique place. I’ve never lived anywhere so vibrant ALL the time. The snow was wonderful and our kids loved it. Keep up the great recipes. I made this recipe using tilapia filets from Costco. Turned out wonderfully! My toddlers loved this!